There's another name for this now, but when I was growing up, my mother could make useful things (and did) out of all sorts of stuff. Nothing was thrown away (it might be given away) as long as it had any use in it. 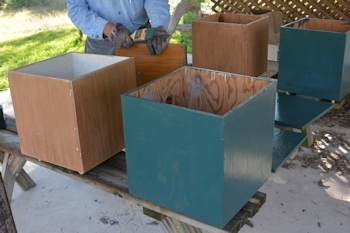 She made end tables out of apple boxes, painted them so they were bright an attractive. She had other furniture, but mostly she combined materials she could get cheaply and made them into what she needed, and most had more than one purpose. When we moved from Austin to San Antonio, into a small house (not the 'tiny house' being touted today, but 750 square feet) it did not have much storage (understatement) and she came up from south Texas with a lot of wood and masonite already cut to size; the masonite became sliding panels on the tiny screened entrance fo the kitchen, and the plywood became four 18" cubes with lids, in which I stored (in heavy plastic tubs) flour for baking bread. That was in...1973 or early '74. The cubes have been used for other storage, too, like yarn, magazines, toys. And here they are set up where they will be, in the living room that last year got new carpet and new furniture. Pretty spiffy. One at each end of the large couch, two in the space between. 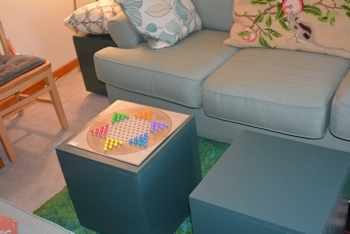 We played a game of Chinese checkers to celebrate. it's a narrow space between the loveseat and couch; the geometry of the room (where doors are placed) makes this necessary. But the 18 inch cubes fit perfectly When the paint is fully cured (they dry to touch in a couple of hours but curing to "you can wash it with soap and water" is said to take 14 days) I'll take the lids back outside and give them a good polyurethane top coat. My late great uncle Ray (grew up in the 19th century) called that 'making eel pots out apple cores'! I can remember helping my mom make bookshelves out of fruit crates. Two crates would be stacked together on their sides, and fastened somehow [don't recall that part]. Where I got to help was wrapping the whole thing in wallpaper. This was long before Contact paper. Yeah, those wooden fruit crates made bookshelves, bedside tables, and stored many things besides the original fruit. So did the bushel and peck baskets that were then easily found. Mother and I both salvaged scrap wood from various shops and used it for a variety of purposes. Also sturdy clean cardboard boxes, which when stiffened with a few coats of paint will last surprisingly long. And just to complete the proof of how old I am...the day after Thanksgiving was the day after Thanksgiving, not Black Friday. Not only were stores not open ridiculously early, they were not open on Thanksgiving. Store workers got Thanksgiving off, all of it. Not counting holidays, stores were closed on Sundays. I remember when the first "convenience" store in town opened, and you could get a few things after 7 pm without calling the store owner and claiming an emergency need for a pound of nails or a new bath towel. Stores often stayed open late on Saturday nights (always before Christmas.) There was no such thing as "open 24 hours." The hamburger place closed at 10, midnight on home football game nights. If you needed a prescription filled after hours, then you called the drugstore's emergency number, woke up the store owner, who woke up the pharmacist, who then drove the prescription to your house because if you needed it in the middle of the night you were too sick to drive. Lovely work! Your mother was thrifty, and I love that you've kept these, and kept a use. The shades of teal (and is that grey in the background?) go really nicely with the lounge. Oh boy, I had long gold shag in one of my childhood homes. It was a very loud gold too. I loved it -- but I don't think anyone else did. There was a long shag in this house that combined gold and orange and one other color...and turned out to be the exact color of the local scorpion species. You could not see them on the carpet unless they moved. So walking along reading a book down the hall...was not smart. In fact, I learned to watch the floor in front of me carefully at all times. That's alarming! I'm glad scorpions aren't something I have to deal with here (despite the snakes and spiders). Yay for refurbishing and re-purposing! It's a way to celebrate old memories and make new ones. I hope your Thanksgiving was full of happy memories [also, good emergency seating]. The cubes were a hit with the Thanksgiving Day guests, who said they definitely improved the look of the room (and gave a place to put your feet up.) Still a bit tacky with the lids, so today (Yesterday I forgot) will unstick them and prop them catty-wampus again to finish drying. The damp air isn't helping. They fit the room perfectly. Bravo. Thanks. Now to get a couple of table lamps in there.